When the Japanese started to be so successful in the West during the 1970's and 80's, we overreacted by condemning managers for being too bureaucratic. There was a great hue and cry to get rid of managers and replace them with leaders. This led to a lot of confusion over the differences between leadership and management that still plague us today. So, when you read these comments on leadership style, keep in mind that they could just as easily be about management style. 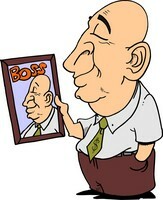 Early thinking about leadership style talked about whether to focus on the task or on people. Hence 2 leadership styles: task-orientated and people oriented. A similar idea talks about providing structure versus showing consideration for people. Either way, it's a question of whether the best way to get work done through employees is to offer them clear direction, stucture and task-related guidance or whether to focus on the needs of employees to be motivated, recognized, valued and included. This leadership style discussion didn't get much beyond the obvious conclusion that a bit of both was probably the best idea, except in a crisis where you needed to be more task-oriented. Leaders could also flex their style depending on their objectives. If they just needed a job done quickly, then a task-oriented style was quick and simple. However, if you needed your team to accept a potentially unpopular decision or feel some ownership and commitment to a difficult goal, then a focus on their needs is important. These two leadership styles are variations on the themes we have already been discussing. The main difference is that the focus now is not so much on how to get work done through employees but the best way of making decisions. Being participative has also been called the consultative or democratic style, although there are fine differences. Consultative leaders ask employees for input but make their own decisions, while democratic leaders seek consensus as far as possible. The autocratic style is also sometimes referred to as dictatorial. While it is again about decision making, where leaders make their own decisions unilaterally without consulting employees, this style is clearly more task-oriented than the participative, consultative or democratic styles. As with the other styles discussed above, it makes sense to use a participative style when you need employees to feel committed to the decision or to boost employee morale, to develop employees or foster a sense of shared ownership. Of course, this style takes more time, so a more autocratic approach is reasonable when time is of the essence. There are other, more complicated leadership styles, that rarely make it out of academic discussions. Pick up an academic leadership textbook if you want to delve into these intricacies. This is another variation on the task versus people theme, but here the focus is on the leader's attitude toward people. A theory X manager thinks that people can't be trusted, that they are lazy and have to be pushed to work and closely monitored. This outlook then generates a task-oriented leadership style where the manager focuses on making sure the job gets done without paying much attention to people's needs or caring about their feelings. Conversely, the theory Y manager thinks that people are responsible, naturally motivated to work hard and trustworthy. Here, the focus is on helping, coaching and developing people, paying attention to their needs and feelings. To some extent the theory X outlook is a self-fulfilling prophecy because, when people are treated as if they weren't responsible, they are likely to behave as expected, not caring about their work. This is also true of the theory Y style. People given responsibility and trusted are likely to work harder to prove that they are indeed responsible. Like most leadership style theories, this one is a little simplistic. The truth is that there are both types of people in the world (motivated and unmotivated) and they should be managed differently. Still, people are more likely to rise to the challenge if you start by assuming them to be responsible. Visionary - useful when an organization needs to overcome a massive challenge, achieve a difficult long term goal or needs to move in a completely fresh direction. This is a variation on the old style of providing structure. Coaching - where the leader coaches individual employees on how to develop and be more effective at work - this is a novel twist on the old people-oriented style. Affiliative - here the leader stresses team spirit and collaboration, building on people's needs to belong and be accepted, another variant on the old people-oriented style. Democratic - this is the same style we called participative or democratic above, useful when you need to gain commitment to unpopular decisions. Pacesetting - this is another task-oriented style in which the leader sets a hard working, fast paced example. Commanding - this style is just another label for autocratic or dictatorial. On the whole, Goleman introduces a few novel twists to conventional leadership style theory, but the basic underlying themes are the same - task and structure versus people. Leaders, on this model, can be high on one axis and high or low on another. Here is an explanation of the 4 extreme points plus what it means to be in the middle. 1,1: Apathetic leaders exert minimal effort and show little concern for either employee motivation or task results. 1,9: Country Club leaders care a great deal about people's needs while neglecting results. They are nice and helpful but not very task oriented. 5,5: Middle of the Road leaders try to be all things to all people, not a balance that can be struck consistently. They also put too much emphasis on compromise. 9,1 Dictatorial leaders have a very strong focus on the task and results with little concern for people's needs, hence they can be dictatorial. 9,9 Team leaders balance a strong focus on results with an equal concern for people. Blake & Mouton did not claim that any one style was best, but rather that different styles were appropriate in different situations. This is a modern way of capturing the older autocratic versus participative style distinction. Directive leaders aren't necessarily dictatorial or autocratic but they like to think for themselves, make their own decisions and direct the efforts of others. They see their teams as there to execute the leader's decisions. This may work in factories but less so for knowledge work and creative thinking where employees want to have more of a say in what gets done as well as how it gets done. Inclusive leaders take a very active part in fostering teamwork. Their decision making style is participative but not just in the narrow sense of generating better solutions and fostering shared ownership but in the full sense of making employees feel valued for their input. Inclusive leaders ask team members for their input before proposing their own solutions. Leaders who are partly directive and partly inclusive might suggest their own ideas first and then ask for feedback while the more strongly inclusive leaders first ask what team members think. They act more as catalysts, facilitators, coaches and developers of people than as authoritative decision makers. Having now reviewed conventional leadership theory, it should be noted that the view taken on this website, LeadersDirect, is that leadership style is really management style, that it is the job of managers to get work done through people. Leadership, we feel, is about influencing people to change direction. See What is Management? for a discussion of how we view the differences between leaders and managers. See Leadership Style for a different take on the question of style. Want to read more on the relationship between vision and leadership? If leadership isn't just an influence process, then it's a role in a hierarchy, but this is biologically primitive. See Primitive Leadership for more on this topic. For more discussion of how leadership can work as influence, see Thought Leadership, Bottom-up Leadership and Organic Leadership.